Dell Inc. has designed and implemented several corporate social responsibility programs centred on the use of technology to make positive social and environmental impacts. One of these programs focuses on pediatric cancer research. Necessity prompted the multination company to focus its attention on pediatric cancer. Accordingly, the small patient-base of pediatric cancer generates little attention from governments and organisations. Through the Children’s Cancer Care initiatives nonetheless, Dell empowers clinical researchers and medical doctors by providing technological resources and support aimed at accelerating different facets of cancer treatment. In 2011, Dell partnered with Neuroblastoma and Medulloblastoma Translational Research Consortium or NMTR and Translational Genomics Research Institute or TGen to advance neuroblastoma research. Neuroblastoma is one of the deadliest forms of cancer affecting children. It involves the growth of malignant tumor composed of neuroblasts in the adrenal glands, as well as in the nerve tissues in the neck, chest, abdomen, and pelvis. The primary goal of the partnership is to develop precision cancer treatment using scalable high-performance computers from Dell and the cloud-based IT infrastructure from TGen. The TGen cloud runs under several Dell technologies to include Dell PowerEdge Blade Servers, PowerVault Storage Arrays, Dell Compellent Storage Center arrays, and Dell Force10 Network infrastructure. Personalised treatment or more appropriately, precision medicine is one of the treatment options for some types of cancer. Individual genetic differences remain an obstacle to effective and efficient treatment according to Dell. Doctors and patients usually rely on a trial-and-error approach in their search for a treatment. This takes too much time however. Furthermore, the approach does not have any guarantees. Nonetheless, precision medicine provides a more feasible approach against cancer. Using the genetic profile of a patient, as well as the genetic profile of the tumor, doctors are able to identify the appropriate drug substances and dosages. The goal is to guarantee the responsiveness of the patient and identify the vulnerabilities of a particular tumor. But generating a genetic profile through genomic sequencing takes time. The process also includes comparing the sequence to a large database to map and match a particular genetic profile with other treatment profiles. Technology can expedite the process however. This is where Dell and its partners enter the picture. 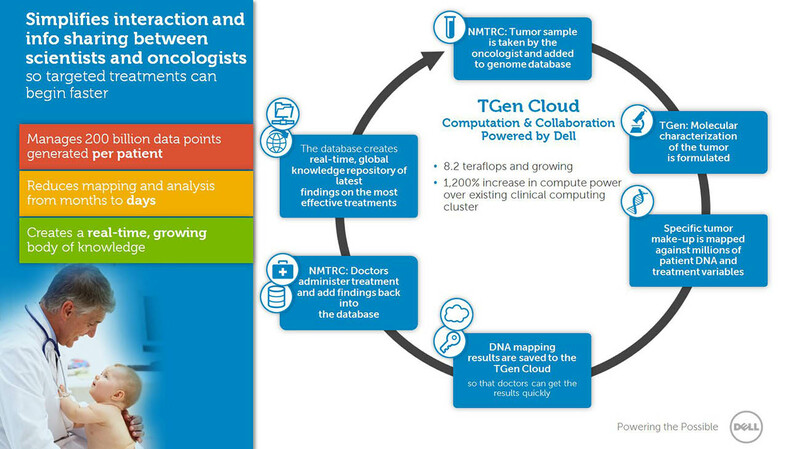 The Dell-powered cloud-based infrastructure from TGen allows collaboration among medical researchers and physicians. Apart from accelerating genetic sequencing, the technology also accelerates genetic analysis and the identification of targeted treatment for each pediatric cancer patient. The infrastructure essentially improves the availability of data and information. In addition, it also creates a repository of the latest findings on the most effective treatments. From the aforementioned, cloud computing technology and the use of big data are at the heart of the entire process. Cloud computing allows researchers and doctors to store and access big data that could help in tailor fitting a treatment for a specific patient. The second involves the use of cloud technology. Through cloud computing, physicians can easily map tumor characterisations to the treatment database. This ultimately allows quicker access to personalised treatment. Researchers are also able to analyse the molecular data of a patient in six hours instead of the conventional 10-day period. In a nutshell, the entire process involves collecting and generating data and information for precision medicine using cloud technology. The technology also reduces the entire process that would otherwise take months to just days. Patients can begin receiving personalised treatment much sooner.